I’ll never forget the first Banana Health Shake I enjoyed many years ago at Ellen’s Stardust Diner in NYC. Since then, I’ve often experimented with making my own breakfast smoothies. For me, coming up with the right combo of ingredients was not just about trying to eat healthier & losing a little weight… it really had to taste great, or I wouldn’t go through all the trouble. I discovered that one of the secret ingredients in Ellen’s shakes was toasted wheat germ. It added a bit of crunch to the shake, which I love, and is also an excellent source of vitamin E & folic acid. For fruit, I use bananas, strawberries, and blueberries. The trick is to freeze the fruit before blending, so that your shakes come out thick & cold. I like to prep about a weeks worth of fresh bananas & strawberries, so that I can make a shake in a matter of minutes. For ease, I use Wymann’s Fresh Frozen Wild Blueberries. I also add flax oil because of its high concentration of Omega-3’s. For protein, I use an all-natural vanilla whey powder, and to get my veggies, I add a scoop of Macro Greens “Nutrient Rich Super Food Supplement.” When my photographer friend Francis first suggested I try Macro Greens, I was a bit leery about adding a veggie supplement. But after trying it, I was sold. So blend away, and by all means, experiment with different ingredient combinations of whatever makes you sing ! – For best flavor, allow bananas to ripen thoroughly before freezing. – Wild blueberries are higher in antioxidants than cultivated blueberries. – When fruit is out of season, blend in a packet of stevia, or a tablespoon of honey to sweeten the mix. -Place first 5 ingredients, plus sweetener (if using) into blender; blend for about 15 seconds. 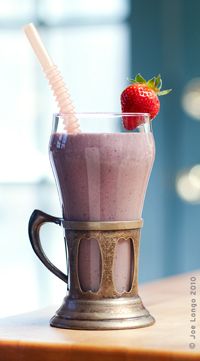 -Add frozen fruit; blend until thick and smooth.